Pop Cycle is now piloting a scheme offering training for asylum seekers in basic food preparation skills, using a professional kitchen and practical workplace English. I wanted to offer people whose lives are on hold some help to think about their future, or just a pause from the difficulties they are facing. We’ve created a friendly and supportive environment to learn in. 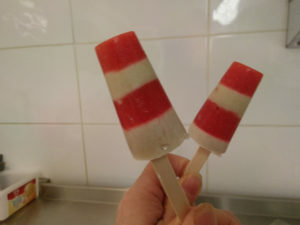 Making lollies can be relaxing and fun. 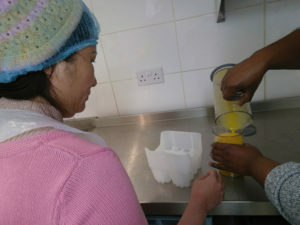 So far we have learnt about food hygiene practises in the UK and preparing fruit ice lollies. Trainees can practise the skills they think will be useful to them now or in the future and have that all important first reference for their first job or placement. We started in January and have been really lucky to use the kitchen at Swansea Community Farm. The African Community Centre have supported us by helping to cover transport costs for attendees on their projects. I’m delighted to be able to continue with this project into February. The ladies who attend are also learning how to run the farm cafe which will hopefully give them useful skills for the future. We have also learnt a little about different sugars we use such as agave, and reducing sugar content, and labelling. We will learn more about Fairtrade and vegan ingredients this month. The idea to offer these workshops is kind of a natural progression. With experience working with Fairtrade producers I wondered if this could be an opportunity for people here or just a little relief for people who have been through trauma. I’m so glad we’ve been able to put this pilot. I first heard about offering meaningful opportunities to asylum seeking volunteers through the City of Sanctuary. The waiting game can be demoralising wherever you are from. Asylum seekers can’t work and can wait years for the outcome of their refugee status, often their qualifications won’t count so they are starting from scratch. The lollies are on sale in the farm cafe and hopefully soon in local cafes.